Aurora Nessly is an ICE (Institute of Culinary Education) graduate from NYU and works as a private chef and food writer. She is also a freelance writer for the Cook and Go Culinary Studio based in New York City. “I have always had a love for cooking, even at a young age. Growing up, I have had the opportunity to build a cross-country palate through living both in the Pacific Northwest and in Eastern Pennsylvania. From the Pacific Northwest while living in Seattle, I have grown to love Dungeness crab and bare bone cooked salmon with just a little lemon, salt, and pepper. From Eastern Pennsylvania, I have learned to love the severe changes in season, while my food tastes have changed right along with them. In the heat of Summers, I would survive by the cool Italian ices and sweet corn. And in the Winter, every kind of meat and potato you could imagine would cross my plate. Aurora’s team contacted me with an offer for content partnership. 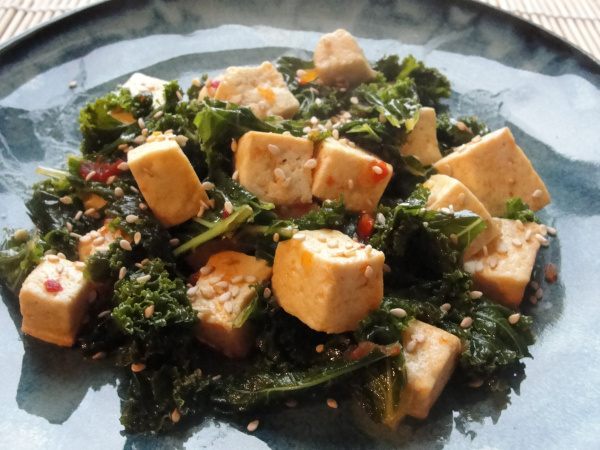 Here is a recipe from her – Quick Kale and Tofu Stir-Fry. This is a great dish inspired for vegetarians, vegans and health-conscious eaters. If you’re looking for a healthy meal that is very quick and easy to pull together, this is a great recipe for you to try. The kale not only packs this meal with delicious nutrients, the tofu adds tons of protein. It takes only ten minutes to make, and is perfect for a light, filling lunch, or even for a dinner that you can throw together in a snap! In a large wok, or frying pan, add 1 tablespoon of sesame oil and bring to medium high heat. Add tofu to form an even layer and cook for 1-2 minutes. Add the kale and continue cooking for 6 minutes, turning from time to time. Drain excess juice from tofu and kale and add remaining sesame oil, teriyaki sauce, ground mustard, and sambal. Cook an additional 2-3 minutes then top with sesame seeds. Enjoy! Option: For a fuller meal, serve on top of a mound of brown rice and make sure to spoon in some of the cooking juice on top. Delicious!